Book Review: “Total Church” by Tim Chester and Steve Timmis | J.W. Wartick -"Always Have a Reason"
Tim Chester and Steve Timmis aim to present a gospel-centered vision of the local church as a fellowship community oriented towards missions in Total Church: A Radical Reshaping around Gospel and Community. The notion that the church must be community- and gospel- oriented is absolutely central to the whole book. Time and again examples are put forward towards how the house church can make a huge impact on individuals. The authors rightly emphasize the notion that sometimes measuring success by pure numbers is misleading and, yes, misguided. Throughout the book, a commendable call is issued to seek using the gospel of Christ and making missions a priority in church. Many stories are provided throughout the book to help make these insights into a practical application. They are appreciated because it gives readers some hands-on ways to deal with situations. I also enjoyed much of the discussion on youth groups and “children’s church.” Basically, it was argued that we cannot simply make the kids a separate unit from the rest of the church. Youth groups cannot just be a game night, because once the youths get past that, “real, adult” church is so vastly different. We need to emphasize the truths of Christianity throughout our children’s lives from the very earliest stages. The book, however, has some deeply problematic elements. First, the view put forward of counseling and psychology was, frankly, disturbing. There’s a lot going on in this chapter, but it really seems to come down to the authors saying that “secular” psychological treatment doesn’t help, only the gospel can. We just need to embrace the truths of the gospel and all will be well. One representative quote: “The Bible addresses the entire range of problems we experience in living in this world… It addresses all the basic and essential issues of what it means to be human, both in our sin and in our salvation” (Kindle location 1802; all references are to Kindle locations hereafter). Later, this is made into an application that if we just focus on Christ, our sufferings won’t seem significant. At the end of all of this, there is a vague reference to how some kind of counseling outside of church might also be needed, but it is too little, too late, too vaguely stated. I think this is a deeply misguided attempt to describe a “Christian” view of counseling which simply is–ironically–not outlined in the Bible. Choosing a couple quotes about how our present suffering can be alleviated or overcome by God does not mean that going to “secular” [whatever that means–and in exclusion of the reality of Christian] psychologists and therapists is a poor decision. Yes, we should try to deal with and help with these issues in the context of a community of faith. But God forbid that we approach someone who self-harms [one example they used] and just tell them that their problem is reducible to a spiritual problem, as the authors do: “The term ‘spiritual’ is not simply another category alongside biological, physical, environmental, upbringing, or relationships. Each of those forms of suffering, passive or active, is always and at some point a spiritual and theological issue” (1881). This seems clearly reductionistic and potentially damaging. I felt this whole section was quite disturbing. Second, there is a very dim view of academic theology put forward. The authors complain that academic theology is often just for academics and compare the probably legendary story of medieval debates over the number of angels on the head of a pin to modern evangelical theological journals as “no less obscure” (2159)! This is another huge difficulty in the book because it ignores the wide implications of “obscure” theology being done in academia for the church at large. By reducing theology to the task merely of the local church (2148), it seems there is something of a denial of the Holy Spirit’s work in guiding the church at large, and, yes, a danger of local churches simply deciding that soul-destroying heresy is sound theology without any support from those “obscure” academics. A blithe dismissal of this enterprise relegates authors like Augustine, Aquinas, Calvin, and more into the scrap heap of obscurity. Third, the book largely dismisses the enterprise of apologetics as dealing with issues of the mind and instead argues that “The problem is not that we cannot know God. The problem is that we will not know God. It is a problem of the heart rather than the head” (2344). Later, this leads the authors to the claim that the goal of apologetics must be to “demonstrate that unbelief is a problem of the heart rather than a problem with the head” (2419). Apologetics is envisioned as not being intellectually engage but rather engaged with trying to show people the relational problems they have with God (2467). Not only does this reduce apologetics quite a bit in scope, but it also performs some serious psychoanalysis of those who do not believe by saying that the ultimate problem with every non-Christian is that they somehow have some passionate anger against God. Now, unless we are to assume that all of these people are lying to us, plenty of atheists throughout history have grounded their rejection quite clearly in intellectual issues. Numerous modern studies have shown that the people leaving the church often do so because of perceived anti-intellectualism or a failure to engage the mind. The task of apologetics can not, and dare not do this, be reduced to vague exploration of the heart rather than the mind. We must engage with the intellectual attacks on Christianity and put forward our position in a winsome manner. Fourth, the Chester and Timmis often say they are not saying their position is the only way to do something, but then continually pound the notion that their way is the only biblical or gospel-oriented way so often that one wonders whether they do believe other approaches might work. The discussion of the biblical warrant for house churches is but one example, where, after asserting that there is nothing inherently wrong with larger churches, the authors compares them to pagan temples founded due to Constantine’s making Christianity the civil religion of the Roman Empire [a historical reality that should be questioned, as it was not the official or exclusive religion until Theodosius I, though this is a complex topic not worth getting deeply into here] (1255). If one approach is “biblical” and other other is merely capitulation to replicate paganism, which one is acceptable? Speaking inclusive approaches but following up with things like this makes me wonder whether there is much generosity happening towards those with whom the authors disagree. The kindle edition of the book also has some typos, such as replacing “initially” with “Initial” (yes, capitalized in the middle of sentences) at several places in the text. Another one is this portion: “I have used the Initial person, but not to trumpet my experience… I have used the Initial person to show that what I am describing is not impossible rhetoric or unrealistic idealism… At Initial they expressed concern that we did not have an accountability structure over and outside us…” (2782). Looking at the print edition on Amazon, I find that it says “first” in all these places. I don’t know if this is the same with all Kindle editions or just the one I received for review. Total Church: A Radical Reshaping around Gospel and Community was, unfortunately, not what I had hoped for. Will readers get insights into founding house churches and making communities therefrom? Yes. But unfortunately there is an awful lot of baggage to go along with those insights, including, but not limited to, rejection of massive amounts of Christian academic theology, undercutting Christian apologetics, distorting a Christian view of therapy and psychological treatment, sometimes questionable exegesis, and more. Crossway provided me with a copy of the book for review purposes. I was not obligated by the publisher to write any kind of review whatsoever. 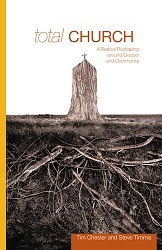 Tim Chester and Steve Timmis, Total Church: A Radical Reshaping around Gospel and Community (Wheaton, IL: Crossway). « Really Recommended Posts 4/17/15- Aquinas, Creationism, Abortion, and more! Too bad to read this review. Thanks for the review. Thanks for stopping by and reading! Have you read/seen the book yourself?